Flexible PCB material, enables the production of low volume low cost flexible prototypes. PCB Supplies FR4 Flex is typically used in the PCB industry for the manufacture of Semi-rigid multilayer boards...but thinking "out of the box", allows us to use this material for in house prototypeing of Flexible PCB's and more. Flex Fr4 is just 0.127mm thick, This double sided, 1/2oz copper, material is ideal for making flexible circuits! Using the same techniques as used for making a standard 1.6mm FR4 PCB, this super thin, high quality laminate will allow you to manufacture a flexible PCB and solder components directly to the copper tracks using standard soldering techniques and temperatures. Though PCB Supplies FR4 Flex is as thin as a sheet of paper and can be cut to shape with a pair of scissors. The FR4 base material is rigid enough and flat enough to allow soldering of components just like any other FR4 PCB. PCB Supplies FR4 Flex is supplied in our standard 12"X9" sheets, or maybe cut to your preferred size, upto 1200mm X 1200mm. PCB Supplies FR4 Flex is ideal for making membrane keypads using our tactile metal dome click contacts. 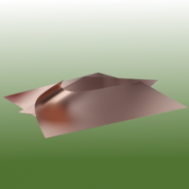 PCB Supplies Tactile - Snap Domes or Flexible embedded PCB Antenna (great for NFC antenna) or Flexible LED carriers. True Flex 12" x 9"